A total of 330 completed reports were received within the six month period between January and June 2017, representing 33% increase in reporting in comparison with the previous six-month period, in which 245 reports were received. Additionally, this level of reporting is significantly higher level than all previously recorded periods and shows a consistent rise since the launch of iReport.ie in July 2013. Assault appeared in 19 cases in this period. Weapons were used in 6 cases of assault and attempted assault. 13 cases of threats to kill or cause serious harm were reported. Sexual assault was reported in 3 cases. 26 cases of ongoing harassment. 12 reports in this period concerned single or multiple counts of criminal damage. 18 reports of racist graffiti. 33 incidents such as verbal abuse, ‘racist jokes’ or aggressive questioning were reported. This kind of incidents frequently accompany or precede the types of incidents addressed by law, however, are neither addressed by criminal law nor the laws on discrimination. 20 cases of discrimination in the workplace. 22 reports of discrimination in access to goods and services. There were 111 reports of racist hate speech online in this six-month period. Social media companies published 82 of these, with 37 on Facebook, 35 on Twitter and 10 on YouTube. 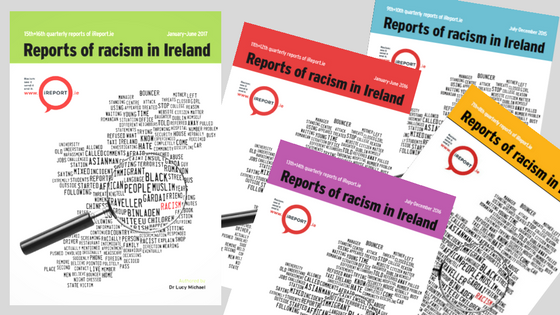 There were 61 reports of hate speech published by Irish newspapers (including their online editions and social media accounts). 2017 was a significant year globally for far-right ideologies, on the rise since the global economic crisis and now increasingly influencing the political mainstream. This has direct and drastic consequences for minority communities who are often caught between racial violence and official and structural exclusion, discrimination and marginalisation. At Charlottesville VA, the Trump effect manifested in the so-called “Alt-Right” rally which incited white supremacist violence to murder, in response to which the US President bafflingly tweeted that he condemned violence “on all sides”. At the same time, the aftershocks of the Brexit campaign have led to a huge increase in documented attacks on mosques and on Muslims, and a parallel explosion in hostility towards migrants. In central and eastern Europe, the once Europhilic and liberal political class is now increasingly authoritarian, rolling back against women’s and LGBTQ rights, while popular sentiment is too often apologetic of the wave of xenophobic and islamophobic violence right across the EU. The multiplier effects of these global ideological shifts are now falling on fertile ground even in Ireland where the gap between rich and poor is wider than ever, and the housing and homelessness crises deepen. 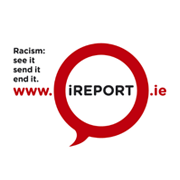 It is in this context that we must make sense of the further rise in reports of racist incidents received through the iReport.ie system in this period. Ireland in 2017 has been a year both of significant milestones and significant missed opportunities in the development of our capacity as a society to recognise and combat discrimination, racism and hate crime. In January The Irish Times published what can only be called a fake news apologia for the “Alt-Right”, generating hours of sensationalist talk-show airtime, but little sense. In February the government published its “Migrant Integration Strategy”, a brief document outlining 76 aspirations, but which falls far short of meeting the standards of a UN Durban Declaration-compliant National Action Plan Against Racism. In March the government recognised Traveller ethnicity, bringing it into line with Travellers’ self-identification as well as expert academic and international human rights consensus. This position is one to which the state had been dragged thanks to decades of tireless work by Traveller activists and organisations. However, this victory has yet to translate into concrete gains for Travellers. It remains the hope of Travellers that improved regard from agencies will facilitate better health, education, employment or accommodation outcomes. But as this report shows, Travellers and Roma still experience high levels of hostility in every aspect of their everyday lives. This report also highlights continuing high levels of hostility towards Muslims, reflecting global and national media islamophobic tropes and discourses, as well as against people of African descent who also continue to face very high levels of discrimination in the labour market. In 2017, ENAR Ireland continued its work with a range of civil society organisations to gain all-party support for a Private Members Bill on hate crime that is tailored to the needs of the Irish criminal justice system and meets the recommendations of international experts in the field. At the same time, Ireland’s inability to protect people from hate crimes is the focus of an ongoing investigation by the European Parliament’s PETI committee, which was triggered by ENAR Ireland, citing our obligations under the EU’s Framework Decision on Racism and Xenophobia. This year, the Irish state did not submit any data to the annual European hate crime data published by the OSCE’s Office for Democratic Institutions and HumanRights (ODIHR) whose report relied almost wholly on ENAR Ireland’s data generated through iReport.ie. Garda data on hate crime remains appallingly poor. And while the An Garda Síochána still blames people for not reporting, our data clearly shows that what is at fault it is the force’s ability to respond appropriately. This gives urgency to our call for an overhaul of our capacity to tackle hate crime and all manifestations of racism. 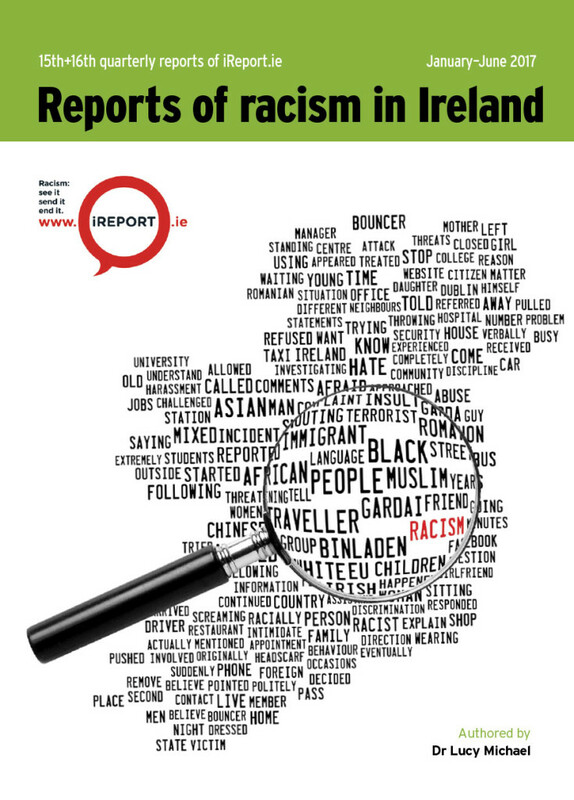 Read the full Q15 & Q16 iReport Reports of Racism in Ireland here.